We get it, you’re busy! We all are! As a business owner, you’ve got a ton of responsibilities on your plate and it’s important to recognize when you need help. Hiring a marketing company is just one thing you can do to skyrocket your business and drastically reduce your stress levels. Wondering if it’s the right time for you? Check out these 5 ways to know it’s the right time to hire a marketing agency! Your sales are in the toilet. Your marketing always takes a backseat to other tasks. Your marketing results are hit and miss. Flat out, you don’t like marketing your business! If any of these five reasons resonate with you, continue reading! Marketing is an essential part of owning any business in the present day. As the world evolves we are only becoming more digital which will be a huge stress for you if you struggle with any of the above points. So, what are the actual benefits of working with a marketing company? See for yourself and make an informed decision! You get more than marketing expertise. By outsourcing your marketing efforts, you get so much more than just marketing expertise. Marketing agencies work with the most up to date strategies to drive sales and leads, and keep up with current industry standards for every aspect of social media, email marketing and more. Do you have time to constantly play catch up with these trends and strategies? Marketing agencies also have access to the most advanced technology to streamline your business processes and online reputation management. Some businesses choose to hire an in-house marketing team, which is great if you have the budget it. Working with a remote marketing team is going to give you the best of both worlds. You have access to a large network of digital marketing gurus PLUS you save the cost of hiring an in-house marketing team, setting up office space, obtaining computers and other equipment, and paying the high price tag of the marketing tools mentioned above. Being a responsible business owner involves recognizing that not every task is your strong suit or cup of tea. If marketing is the one thing on your daily to do list you dread or constantly push to the back burner, take if off your list. Removing something you hate to do or are simply not good at will free up time you can fill with other day to day operational tasks. Working with an established marketing agency guarantees there is very little effort needed from you. Sure, we love getting your feedback and having you send over graphics or business specific information (examples: promotions, sales, etc. ), but otherwise you’re hands off with an agency. We develop a marketing strategy for you and handle all the aspects of implementation required without any hand holding or training from you. In house marketers can lose sight of the big picture easily when they are immersed in the day-to-day activity of your business. It’s easy for an in-house person to start wearing too many hats and lose focus on the daily marketing efforts that need to take place to scale your business. Marketing agencies also present an outside perspective that will give you honest, reliable feedback where many employees may feel uncomfortable expressing new ideas or opposing opinions. Ready to scale your marketing efforts and take your business to the top? 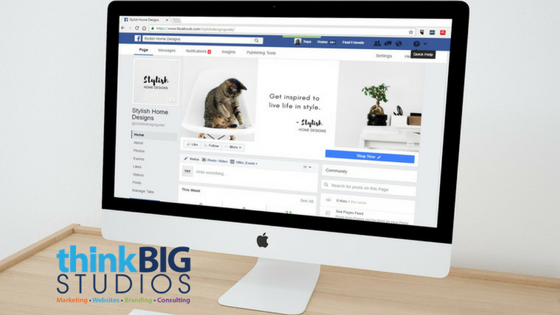 The team at Think Big Studios is waiting to hear from you. Let’s get started today!